[ Sir John Pender, Manchester textile merchant and submarine telegraph cable pioneer. ] Autograph Letter Signed ('Jno Pender') [ to the physician Sir William Henry Allchin ], explaining why he cannot dine with 'the Directors of your Company'. 'Manr. July 10/65', i.e. Manchester, 10 July 1865. 2pp., 12mo. A square has been cut away at thee head of the leaf (probably to remove Pender's monogram), otherwise in good condition, on lightly-aged paper. The recipient is not named but it is the physician Sir William Henry Allchin. The letter reads: 'On my arrival here last evening I found an invitation from the Directors of your Company to dine with them at Richmond on the 17th. inst. I regret that I will not be in Town at the time. The Card I fear by some mistake reached my hands late.' From the Allchin papers. Full title, with motto: 'Two Letters to the Right Honourable the Earl of Sheffield; in which His Lordship's Report to the Meeting at Lewes Wool-Fair, and the Proceedings at a recent Meeting of Wool-Growers, at the Free Masons' Tavern, are examined; and the True State of the Wool-Question attempted to be shewn. | By J. B. S. | Veritas Nihil Veretur Nisi Abscondi.' A scarce item: no copies at the British Library or other deposit libraries and the only copies on COPAC or OCLC WorldCat at Edinburgh University and Senate House. + 76pp., 8vo. Disbound, and with first leaf (half-title) loose. Manuscript report by Bathe & Kindon, floor cloth manufacturers, of the resolutions of a meeting of the London Floor Cloth Manufacturers, with manuscript draft of the unnamed recipients' long reply. Swan Street, Kent Road [Bermondsey, London]. 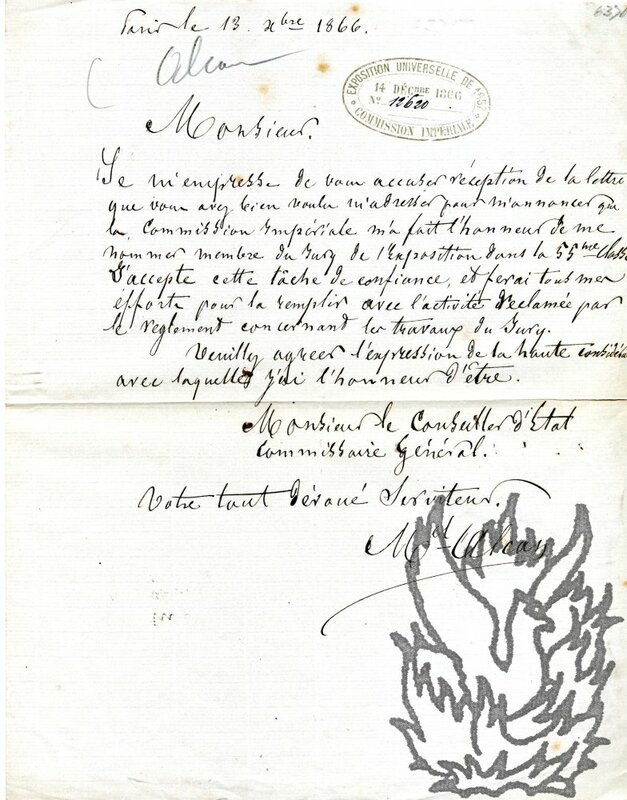 29 January 1853. The report is 3pp., 4to, on a bifolium. Signed on behalf of the firm: 'Hoping that this information of our proceedings will be satisfactory to you | We remain | Gentlemen | Your Obedt Servants | Bathe & Kindon'. The letter begins: 'Gentlemen - | A Meeting of the London Floor Cloth Manufacturers, was held yesterday - & the result was, a rise of 2d. pr Sq: Yard, on their respective prices - this was carried, after considerable discussion, whether the rise should be 2d or 3d - but the majority decided for the 2d - at present'. Notebook containing a manuscript account of a visit to North America by a cotton broker acting for the Liverpool branch of the Manchester firm Reiss Brothers, with details of mills and merchants, recorded while trying to establish a hedging business. United States (New York and Boston) and Canada (Toronto and Montreal). 24 December 1938 to 10 February 1939. 70pp., 12mo, in ruled notebook, with the main text on 51 rectos, 17 facing pages carrying notes, mostly in pencil, and 2pp. of memoranda at the other end of the notebook. In very good condition, in attractive gilt-tooled red morocco red leather binding, with all edges gilt and marbled endpapers. The first page headed 'Visit to U.S. Canada Dec.
Langholen Lodge, Richmond, Surrey. 5 January 1924. Whaite was first cousin twice removed of his more famous namesake. He was himself an excellent artist and teacher, and there is a large collection of his work at the Whitworth Gallery in Manchester. 2pp., 12mo. Fair, on aged, creased paper with slight rust spotting. Mawson begins: 'Mr. H. Clarence Whaite first came under my notice a few years ago when attending my lecture on Decoration & Ornamental Design at the Slade School - and from the first I was much struck with his understanding and grasp of the principles[.] This enabled him to carry out work of exceptional merit. 8vo: 1 p. Sixteen lines of text. The Tyrian arrived in Spithead the previous night 'with a Convoy', and the postal delay prevented him 'from fulfilling Mrs. P's Commission'. They 'remained three days in Ireland' and 'had a good passage there and Back': 'but as we may frequently have the trip, I shall keep it in Memory, I have bought over Two pieces. Enclosed are Patterns of Eight Yards each We call them Poplins, but these are Manufactured only at Dublin and by the Natives called '. States what he paid and sends respects. Docketed on reverse in a contemporary hand. One Autograph Letter Signed and one Typed Letter Signed to W. Perry, Secretary, Royal Society of Arts. 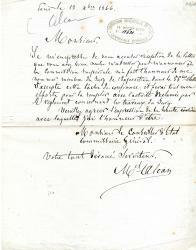 Typed letter: 19 November 1930; autograph letter, no date; both items on (different) Victoria & Albert Museum letterheads. Director (1897-1983) and Secretary, Victoria and Albert Museum, 1945-55. Both items one page, quarto. Both in very good condition. Typed letter bearing R.S.A. stamp. Both items concerning a projected lecture. TYPED LETTER: Perry will have a typescript by the end of the month, 'but as a good dea of my lecture is extempore you may find it rather shorter than you had anticipated. The written part will be roughly two thousand words.' Signed Leigh Ashton'. AUTOGRAPH LETTER: Perry will 'have to be content with the length of M.S. I send in. It may possibly run to 3000 but not more.